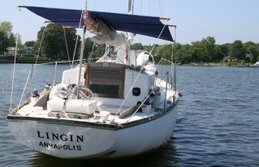 A 1967 Alberg 30, its crew and their adventures. Last night's WNR saw lightening breeze out of the south and an "A1" course for the A30 fleet. We had a decent start and, watching the many fleets before us, headed left. Argo saw a little more pressure near the shore on the right side of the course and headed that direction almost immediately. Second2Nun was the only one that follow Argo. By the top of the course, it was clear that going right was the way to go. Argo had a signficant lead on the the fleet and we were trading tacks with Second2Nun. We rounded in second, closely followed by Skybird and Second2Nun. Laughing Gull and Asylum came next. The downwind leg saw the breeze get even lighter (floater conditions at times) and unfortuntately for us, the big boats caught up with us on the way back from their longer course. The RC properly finished the race at the red nun allow, I think, all classes to get a race in. Argo took first and we took second. The rest of the fleet looked very even coming in, but we didn't stick around long enough to see the actual order. They were moving at a snails pace. It was a beautiful evening to be on the water and I think we all had fun. I know I did!